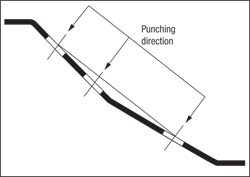 When a stamping is formed in an irregular shape it sometimes becomes necessary to punch holes on an angle, especially when punching is combined with trimming operations (Fig. 1). There is a limit, however, to the punching angle; it should never exceed 30 deg. A common practice has been to limit piercing and punching angles to a maximum of 15 deg. to avoid the complex guiding and support systems needed to control punch, stripper and part deflection. When punching angles exceed 15 deg., it generally is less costly and more reliable to add an additional operation or use a cam. approximate the radii for a pierce punch at a given angle that requires the hole to be round on the face of the part. This is accomplished by creating a layout 10 times actual size. Hole-size elongations can be calculated rather easily and precisely, too. A method for calculating the hole elongation—we’ll call this the minor-axis punch diameter—for holes punched on an angle is shown in Fig. 3. For example: Find the minor-axis punch diameter (X+Y) if the part print hole-diameter specification is 1.000 in., the material thickness is 0.060 in. and the hole is being pierced at a 15-deg. angle. 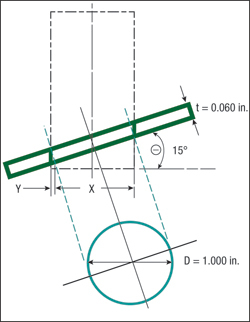 Distance “X” is equivalent to the cosine of the cutting angle (15 deg.) times the punch diameter (D). Calculation Results: Minor-Axis Diameter = 0.9659 in. + 0.0155 in. = 0.9811 in. Final Punch Size = 0.9811 in. by 1.000 in. The resulting hole shape is not perfectly round. 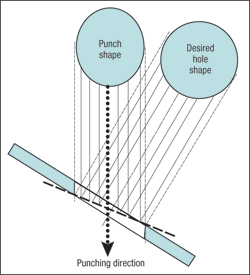 Therefore, the punch and die matrix must be keyed to ensure proper alignment.